When I saw the scene that I started this presentation with, it moved me to tears. Annalise Keating won this case. I was captivated by this fictive landscape because of its improbability in our real world. The United States Supreme Court’s procedural norms could not allow for such a ruling to be handed down. This episode is important precisely because it is unlikely. When I began this research project, I was trying to answer the following question: “why are black women not represented on the United States Supreme Court?” In asking this question, I was doing something that I argue occurs in the field of epistemology all the time. I was thinking of the United States Supreme Court as something that exists only because of the nine individuals that comprise it. That they make the Court. That they construct its way of knowing. That they determine its identity. I was stripping the Court as a geography of its epistemic agency. When I started to think of black women as unique epistemic knowers who interact with space differently, I realized how limiting I had been in my original scope. The question that I now ask is, if racism is built into the DNA of America, like Annalise Keating argued, what are the ways that our institutions, or in my case, the Supreme Court, tell us of this identity trait? How does the Supreme Court demonstrate its racism without using words we are normally used to hearing? The aim of this research project has been to problematize and interrogate my own question. I situate a philosophical perspective within the space of the fictive by using How to Get Away with Murder to explore the ways black women’s epistemologies point us to the importance of recognizing and interrogating spatial knowledges. In this presentation, I want to cover two main points. First, I will define space and epistemology as they pertain to this particular research project. Second, I will demonstrate how I am using the fictive landscape of Shondaland to situate these ideas by walking you all through how I apply black women’s epistemologies to the legal principle of precedent. As McKittrick argues, without acknowledging that space is conscious and breathing we ignore the languages, ways of knowing, rules, and definitions that make spaces distinct. Spaces define and calibrate us just as much as we define and calibrate the spaces themselves. If space is a geography that speaks, what is it saying? Its various languages and ways of knowing are its language. Epistemology deals intimately with not just knowledge as an abstraction but includes the very concepts we mark as worth knowing, to whom we grant permission to define knowledge, and what is permissible to ignore. Black women’s epistemologies are taken up and utilized to recalibrate and redefine widely held legal beliefs in my larger work. I begin with an investigation of the doctrine of stare decisis, which is commonly known as precedent. Washington v. Davis is a real Supreme Court case that was argued in 1976. Three black men by the names of Alfred E. Davis, George Harley, and John D. Sellers wanted to be police officers in the District of Columbia. The written examination administered by the DC police department was notorious for disqualifying 4x as many black applicants as white applicants, making the police force 80% white in a city that was 70% black. Davis, Harley and Sellers sued Walter E. Washington, the mayor-commissioner of DC because they argued that the test violated the Equal Protections Clause of the 14th Amendment. What does this mean? Simply put, in the eyes of the law, for something to be discrimination, it must be outwardly visible, and it must be intentional. So, when Ingrid Egan refers to this case as the reason Annalise Keating’s class action lawsuit should be rendered null and void, she is invoking a very specific kind of precedent. She is insisting that the status quo should be maintained, because the past says so. Precedent, as explained by black legal scholar and Harvard professor Patricia Williams, “has at its heart a form of reasoning according to which the decisions of earlier courts in particular cases somehow generalize to constrain the decisions of later courts facing different cases.” In other words, precedent is intended to standardize the law. It is the Court’s way of accounting for the past. Of taking it into account. This epistemic logic is accepted without interrogation. It is not debatable. It is a given. It is an American value. If we accept that the fictive holds a mirror to the everyday realities that surround us, we can use Ingrid Egan’s invocation of Washington v. Davis to analyze the doctrine of precedent. Just as an intellectual exercise, let’s ask the question. 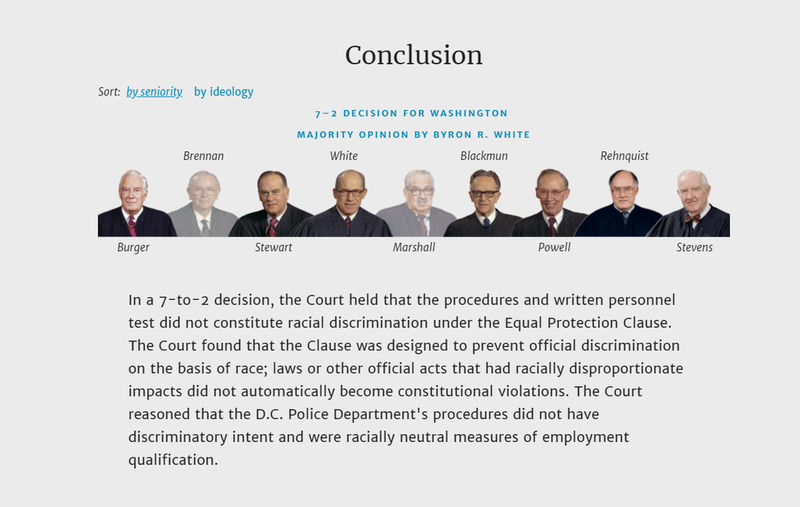 What if the Justices decided that even when invisible, racism and discrimination are just as real? What would be the consequence? Well, practically, the Court would be flooded with lawsuits about the insidious ways that racism manifests itself in this country. It would cripple the Court. It would require an unraveling of the entire judicial framework we’ve come to know. When understood through this perspective, precedent is a tactic of national self-preservation. The past has to be conceived in this way because the alternative is revolution. The alternative is to keep unraveling, pulling back every curtain and revealing the ugly yet true nature of justice in this country. Precedent has quite literally built the context of the United States by defining what can be counted as an adequate retelling of the past. So, how would a reading of Ingrid’s use of precedent be evaluated by invoking black women’s epistemologies? To answer this question, I consult chapter 1 of Katherine McKittrick’s Demonic Grounds. McKittrick argues that as a geography, the landscape of the past, as evoked by the entire premise of Octavia Butler’s Kindred, is contextually rich, incomplete, messy, and unstable. There is no such thing as fixity. There is no such thing as, “the past was so long ago. Slavery was so long ago. Jim Crow was so long ago.” The past, the present, and the future, as both time and place are collapsed, such that they cannot be contained within physical or epistemically defined borders. We see this come up in the clip I showed at the beginning of this presentation. In her closing argument Annalise Keating says things like, “Racism is built into the DNA of America,” “Jim Crow is alive and kicking” and “Some may claim that slavery has ended. But tell that to the inmates who are kept in cages and told that they don't have any rights at all.” These declarations are meant to demonstrate how black women’s epistemologies conceive of time. The past begets the present begets the future begets the past. And so on and on and on. This geographical paradigm shift not only affects the epistemic landscape but also directly shapes it. The doctrine of precedent calls for an erasure of the historicity of knowledge. On the other hand, and I argue, on the better hand, Black women’s epistemologies carry within them histories. They carry ancestries. They carry narratives. They carry time as a spatial reality and as an epistemically diffuse identity. These ways of knowing do not accept precedent as a justifiable way to capture the past. Precedent disassociates context from the past. It sanitizes and revises collective memories. This doctrine relegates the past to just a story we tell ourselves. In my larger research project, I continue to chip away at the foundations of the Court using black women’s epistemic framework to argue that the construction of the Court and its conceptualization of ideas like justice, the law, fairness, and the past are in tension and direct contradiction with the way black women’s epistemologies function in space. I also critique representational ideas of diversity and inclusivity by using Christen A. Smith’s term afro-paradise to refer to the cultural dedication that many have to diversity but the simultaneously insidious commitment to preserving the kinds of institutional violences that are enacted against people every day. My presentation is over, but I think I would be remiss if I did not address the recent occurrences of the Court. On October 6th, 2018, Brett Kavanaugh was confirmed to the United States Supreme Court with a 50-48 vote by the United States Senate. A little over a week before this vote, Dr. Christine Blasey Ford sat in the Senate’s chambers and testified that she was sexually assaulted by Brett Kavanaugh while they were both in high school. I watched most of the proceedings. I watched the fear and agony wash over Dr. Ford as she recounted her story. I watched her answer questions from senators and from the special prosecutor with poise, grace, and as much accuracy and truthfulness that she could recall. I believe Dr. Ford. Full stop. Even though most senators after Dr. Ford’s testimony commented on her credibility, her grace, and her intelligence, 50 voted to still confirm Brett Kavanaugh to the United States Supreme Court. The question that has haunted me since October 6th, is “Why is this allowed to happen?” My research project gets to the heart of this question. That which infects the United States Supreme Court infects all of the institutions that this country is made up of. For a Brett Kavanaugh to be an identifiable representation of justice, it means that the Court allows for injustice. If geographies speak, it should be clearer now, more than ever, what the Court has been saying since its beginning. The Supreme Court was made in a particular image. In the centuries that have followed, this image has been reified and reconstituted by the bodies that have inhabited the space. The utility of black women’s epistemologies is that they act as a translator for all the thoughts, hidden and imperceptible languages of the spaces that act upon us. They give us the language.